With 50 watts of power and a custom 12-inch speaker, the Katana-50 delivers a commanding range of gig-worthy tones that gracefully slice through any band scenario. The amp also excels for home playing, with a uniquely efficient design and innovative Power Control that provides inspiring sound and response at low volumes. 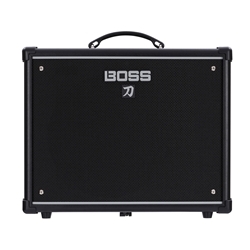 In addition, the Katana-50 includes integrated access to a huge range of BOSS effects, which are customizable using the free BOSS Tone Studio editor software. And with the amp’s powerful Tone Setting memories, you can store your favorite amp channel setups and effects combinations for instant recall.